Small world. | Scuffalong: Genealogy. Small world. – Scuffalong: Genealogy. 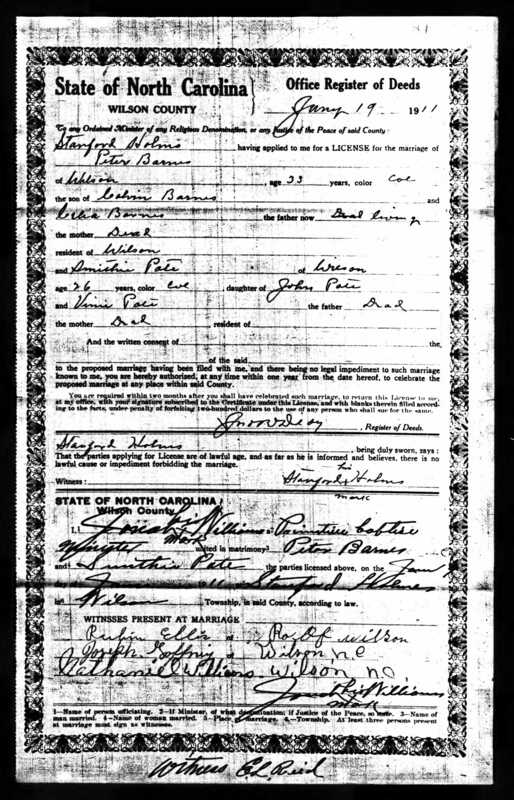 In midwinter of 1911, Primitive Baptist minister Jonah Williams made his way to the home of Stanford Holmes to preside over the marriage of Peter Barnes and Sinthia Pate. Jonah was the brother of my great-great-great-grandfather, Adam T. Artis. Thirty-three year-old Peter was the son of Calvin and Celia Barnes. Thirteen years previously, Peter’s brother Redmond Barnes had married Jennette Best in Wilson County. Redmond and Jennette Barnes‘ daughter Edith Bell married Theodore Roosevelt Ellis in 1933, and their first son was Theodore Jr., who married my father’s sister in 1960.